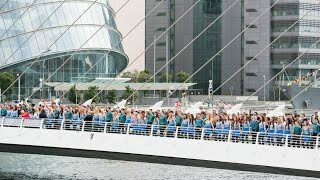 Riverdance World Record Longest Line 21st July 2013 - What a fantastic day on the banks of the River Liffey. A sincere thank you to all who made it happen - .. but most especially all the 1693 record breaking dancers from 44 countries whose enthusiasm and energy made the day and broke the record! Thank you! Lead by Jean Butler and Padraic Moyles and over 115 Riverdance dancers in costume, the Riverdance line stretched for 1km along the north and south banks of the river Liffey, Dublin. The dancers were watched by an audience of thousands cheering them on as they danced for 5 continuous minutes in an unbroken line into the record books. to download video ... Riverdance World Record Longest Line 21st July 2013 - What a fantastic day on the banks of the River Liffey. The longest Riverdance line was achieved by 1,693 participants at an event organised by Abhann Productions (Ireland) in Dublin, Ireland, on 21 July 2013.